When: Friday, May 15 at 6 p.m. The Eugene B. Redmond Writers Club, now in its 29th year, is collaborating with several other area organizations to sponsor the annual free family celebration. Honorees will be feted in jazz by the Bosman Twins and Ptah Williams; poetry/prose by members/associates of the Writers Club; and dance/drums by Dunham-influenced artists, including Sunshine's Community Performance Ensemble. Poets will include Roscoe “Ros” Crenshaw, Shirley LeFlore, Charlois Lumpkin, DuEwa Frazier, Treasure Shields Redmond, Jeffrey Skoblow, Jaye P. Willis and Redmond. A planned multimodal exhibit, “DavisDumasDunhamAngelou,” will be provided from SIUE's EBR Collection. Da-Dum-Dun will include a book signing by Roy (“Afro-Synthesis”) and contributors to Drumvoices Revue. Co-published by the Writers Club and SIUE, Drumvoices often profiles Davis, Dumas, Dunham, Angelou and Roy. The next Community-Engaged Scholarship Workgroup dialogue is Saturday, December 6, 1:00 - 3:00 pm, at Newsong Fellowship Church, 201 St. Louis St. in Edwardsville. If you would like to RSVP, please contact Jim Hanlon at jhanlon@siue.edu or Aminata Cairo at acairo@siue.edu. Click here for more information about the Community-Engaged Scholarship Workgroup. To this dialogue we invite anyone who is interested in the topic of community engagement and scholarship, including members of community organizations and public agencies, scholars at other colleges and universities in the region, and community leaders and residents. Tuesday, November 11, 10:00-12:00, at the East St. Louis Higher Education Campus, Building D, Room 1007. Are you a scholar who wants your research to positively contribute to local communities? Are you a community member who sees colleges and universities as important partners in your community? Do you already have experience with community-engaged scholarship and want to share your insights? Do you feel that universities could do a better job of engaging with communities? Are you interested in fostering positive, long-lasting, and sustainable relationships between the university and the community? If you answered yes to any of these questions, we invite you to join us. We welcome your presence and your voice, even if you do not have experience with community engaged work as part of your scholarship. If you would like to RSVP, please feel free to contact Jim Hanlon at jhanlon@siue.edu or Aminata Cairo at acairo@siue.edu. Attendance is free and light refreshments will be served. Hope to see you on November 11. Stay tuned for our final dialogue session of the semester on Saturday, December 6th in Edwardsville. Public programs and activities related to East St. Louis Action Network are coordinated by the IUR’s Urban Research Scholar and ESLARP Coordinator, Dr. Howard Rambsy. Click here for information about past events. For informatino about upcoming events, contact Dr. Rambsy at hrambsy@siue.edu. Registration is required: For more details and to register, click here. St. Louis Currents, the must-have resource on the region, was the source of discussion at the 2010 St. Louis Regional Neighborhoods Conference. The IUR co-sponsored the Conference in May 2010. Conference attendees heard from Leonard Pitts, Pulitzer Prize-winning columnist from the Miami Herald. Pitts was awarded the Pulitzer Prize in 2004 for his commentary surrounding Hurricane Katrina. The conference highlighted St. Louis Currents and featured many of the book's contributing authors. Workshop topics included: Housing & Community Development, Crime Prevention & Safety, Organizational Effectiveness, Healthy Communities and Youth Issues. 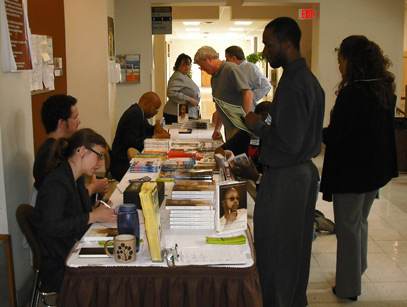 Several of the authors of St. Louis Currents lent their expertise to the sessions and signed complimentary copies of the DVD which were be provided to the first 25 attendees at each of the Currents workshops. The Neighborhoods Conference was held as Harris Stowe State University and co-sponsored by HSSU and SLACO.